Interesting premise, as I read the ‘blurb’ on the back cover. So here goes. 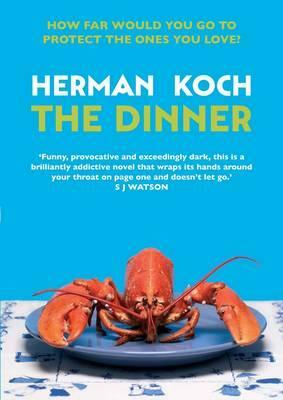 ‘The Dinner’ is Dutch author, Herman Koch’s 2nd book published in 2009 and translated to English in 2012. It has been adapted for film (US), to be released in 2017 starring Richard Gere and Laura Linney. I for one will be watching it. Why? Because the book is intriguing, and I do want to see if it has been translated well to screen and how the characters are portrayed in the film. The plot appears simple. Two couples – brothers and their wives – meet at an upmarket restaurant for dinner. There is an issue about their children that must be discussed, but obviously such a difficult topic to speak of that they miserably avoided it through 2 courses and various interruptions. So what is this “important matter” that must be discussed and resolved? Internal monologue of Paul Lohman, the protagonist, offers readers insight into the psychological state of a younger sibling, never quite living up to a successful older brother, with a chip on his shoulder and repressed anger. And through his lens, there is the arrogant older brother, Serge, the defiant yet helpless sister-in-law, Babette; and his loving and supportive wife, Claire who is most importantly his ally as against the other couple. This story ultimately is about what people, and parents, will believe to protect their own psyche and as a defence to love. It provides a slice of the human condition – how we lie to ourselves and what we do when our very existence, as we know it, is threatened. The story is told in a pace causing annoyance was necessary; the discomfort and unpleasantness evoked in me is testament of how well-written this book is, and portending the reluctance of the characters to name and acknowledge the “important matter” – the almost calm and matter-of-fact manner which belies the undercurrents of tension, fear and malice. What are their motivations? Or their responsibilities? Does it matter if the desired outcome is achieved? How will it end for everyone concerned? An intriguing book definitely worth spending time on. I loved this review – it is thoughtful and thorough and I plan to try this book!